A few days ago, I asked my wife about the Hulu service that she subscribes to, as I was curious about what TV series were available. After a few minutes of browsing through the titles, I realised how much there was to see. In fact, there were many series that I wanted to watch. So, I asked if I could watch it on my computer, and she said I could. Now, a few days later, I have watched the first 7 episodes of the classic Battlestar Galactica. All 3 Battlestar Galactica series are available on Hulu Japan. I’m starting with the original series, which only ran for one season. I’d watched a lot of it before, but I couldn’t remember much about it. I’m finding that I’m watching 1 or 2 episodes a night, and should finish the first 1978 series within a couple of weeks. Then it’ll be on to the shorter 1980 series, and finally the much longer and more recent reboot of the Galactica universe. My history with this series hasn’t been very extensive. I watched some of the original and 1980 series on Space channel in Canada, and found it interesting. But I didn’t see all of it. I watched a few episodes of the new series in 2004 when it debuted, but as I came to Japan in 2005, I wasn’t committed to it. But thanks to Hulu Japan, I can watch it all! It’s a veritable BSG buffet! After the three Battlestar Galactica series, I plan to watch Doctor Who and rewatch the entire original Star Trek and Enterprise series. There are several movies I’d like to watch, as well. The original TRON is at the top of my list. I’m enjoying legally watching streaming videos of TV series and movies on the internet! 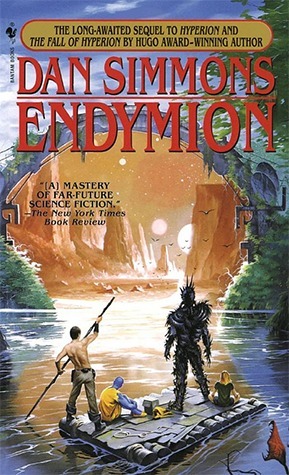 The third book in the Hyperion Cantos series by Dan Simmons is “Endymion.” While “The Fall of Hyperion” immediately follows “Hyperion,” “Endymion” takes place more than 250 years after the the second book. So far, all three books have been very different. This installment follows Raul Endymion of Hyperion, the future messiah Aenea, and the android Bettik as they go on an epic journey over many planets. Of course, the Shrike makes an appearance. What’s interesting is how this book is told from the point of view of three characters, Raul Endymion, Father Captain Federico de Soya, and the mysterious Nemes. Most of it is from the point of view of the former two characters. At times, it’s difficult to tell the order of events at the beginning of the chapters, as it’s not done in real time chronological order. But the time frame is evident as the chapter unfolds. As with the first two books, religion plays a major part in the story, though it mostly shows how corrupt religion can become. In a way, “Endymion” is providing us with a 31st century version of the Crusades. The characters are quite engaging. The chapters involving Raul are told from a first person point of view, while the other chapters are third person point of view. The entire book is written by Raul as a record of what happened. He is a very resourceful and intelligent person who got on the wrong side of the law. However, he has to be the hero. Aenea is a highly intelligent and extremely mature for her age girl of only 11 years old. I can’t imagine any real 11 year old kids speaking like her and with the knowledge she has, but she is a very unusual character, being the daughter of Brawne Lamia. A. Bettik is a character readers of the first two books should be familiar with. He is a brave and noble character and fairly likeable. Father Captain de Soya is a military officer and a priest who is utterly devoted to the Catholic church, and is a man of strong morals who is single-minded in his pursuit of our protagonists. Even though he is the main antagonist, I liked his character. He’s not really a bad guy. Far from it. He’s just doing his job. There’s a large number of other characters to complement these four, and many are very interesting, although some I found contemptible with greed and poor morals. The story itself reads like an epic fantasy novel. While this is pure science fiction, the adventurous style of this book would appeal to readers of epic fantasy, as they travel from world to world in strange new environments. I could imagine each planet very clearly and vividly with Simmons’ descriptions. He isn’t overly descriptive, so the story moves at a decent pace. There is a lot of action and many tense moments that meant life or death. Often, I can tell where a story is going, but in this case, I had no idea. It had me constantly guessing what was going to happen next. It was quite unpredictable with plenty of surprises. I was very interested in what was going to happen next. That makes it a very good story. I wasn’t sure what to expect going into this book after the previous two, but I’m very happy to say that I’m satisfied. I give this a very well earned 4 out of 5 stars. Hello everyone! Long time no write. Sorry about the delay. I’ve been pretty busy recently with a crazy baby daughter and a lack of sleep, but I also finished reading a book. Review coming within a day! In September 2010, I attempted a post a day challenge for myself on my Japan blog. It was a great success, and I thought I’d challenge myself again. Not only will I try to make a post a day on this blog, but also my Japan blog. Obviously, they’ll be different. I plan to make a post about something different every day. If I’m pressed for time or very tired, I’ll do my best to make a post, even if it is short. But I want each post to be worth reading. I also invite discussion in the form of comments. So, please enjoy! It’ll start on Canada Day, July 1st. Last night, I had a Blue Screen of Death on my old Sony Vaio laptop. The system configuration is now corrupt, so I can’t recover the OS and access my old photos. I should be able to save the pictures when I use the hard drive as an external drive. This has had me thinking about a future computer. My current computer is a fairly large laptop. It’s portable, of course, but it’s a bit too large for me to take anywhere easily. I’d like to work on my writing on a smaller, cheaper notebook computer. In the future, I may buy a netbook sized computer for that purpose. My wife has an iPad, which she doesn’t use. I could use it, but I’d like an actual keyboard to type on, rather than a touch screen. A touch screen isn’t ideal for touch typing, as you can’t feel the location of the keys. I touch type, and would rather not look at the keyboard to type. I could get a keyboard for it, but I’d prefer to use Windows. It’ll be great to write anywhere I am. It’ll increase the amount of time I can write. I’m looking forward to it. What is an advanced society? As I was reading “Endymion,” I was thinking about what we would consider an advanced society. In the book, it takes place more than 200 years after “The Fall of Hyperion.” In the previous book, everything was incredibly advanced from our point of view, but go ahead to “Endymion,” and not much has advanced technologically. Religion has also taken over completely. I then thought about today’s technology. Just a few years ago, iPhones would have been considered advanced, like it’s from science fiction. When I was a kid, I had a Speak and Spell, which I was very impressed with at the time. Now, it’s extremely outdated and very simple. The advances we have made in the past 25 to 30 years alone have been quite big. The Internet, computers, cell phones, GPS, commercial space travel, digital TV, hybrid cars, all were just a dream at one time, something from science fiction. Now, they’re commonplace and very ordinary. Then I started thinking about what makes a truly advanced society? We can have advanced technology, but has society matured? I really wonder. I’ll take a quick look at the two countries I’ve lived in. In Canada, I’ve always thought we had a high tech society, on par with the best. I don’t question that at all, but it seems a lot of people have rather old cars. Used cars are big business, as they’re more affordable. But they’re more likely to break down and are not as environmentally friendly. I’ve also thought that it’s taken a while for car navigation systems to become standard equipment, as they are in Japan. Japan is often considered by people to be highly advanced and futuristic. That is most certainly false. While Japan is a leader in technology, what you do find here is that there’s a lot of old stuff. You can find an old house that looks like it’s going to fall apart right next to a brand-new skyscraper. The houses in Japan have poor insulation and are cheaply built. Most of the time, when a family moves out of a house, it’s torn down and another is built in its place. Constant renewal of houses. But the new ones are often built quickly and are prefabricated. They’re flexible and safe during an earthquake, but winter is uncomfortably cold inside. But you can’t beat heated toilet seats in winter. Japan is also behind on adopting computers in the workplace. Banks use computers, but most work is still done on paper. It’s inefficient and incredibly low tech. Japan has amazing technology, though. Robotics, efficient train system, and electronically controlled bathtubs and toilets are some examples, but Japan is behind in banking, wi-fi, and wheelchair accessibility. Technology doesn’t make society, though. Is there a truly advanced society in the world? One where social problems are completely taken care of, military service is not required, or total equality for all has been achieved? I don’t think so. Let’s look at a couple of the problems that my example countries have. Canada has a poor environmental record, made worse by the Harper administration. Prime Minister Stephen Harper has been held in contempt of parliament before, yet he was still re-elected. Something wrong there. The 2010 G20 riots in Toronto showed extremely poor judgment and criminal behaviour by the police. The riots in Vancouver following the Stanley Cup loss last year showed how immature people can be. Obviously not advanced, is it? People were behaving like children. How about Japan? Japan can’t even find a Prime Minister that the people like, not since Junichiro Koizumi. It seems that there’s a new Prime Minister every year. The government can’t even address the declining population and aging problem. They make it prohibitively expensive to raise a child with little help for people who can’t get a spot in public day care for their children because there are so few available. It’s difficult for a mother to even find a job, because they believe they’re most likely going to be temporary staff. Japanese business culture is completely screwed up. Businesspeople are required to stay late after an inefficient use of their time because they can’t leave before the boss leaves. They can’t spend much time with their own children. It’s become a hassle for people to have children, so they choose not to. Police also like to target foreigners, even though they haven’t done anything. Chinese residents are often considered the most likely culprits for any crimes that have been done. None of this sounds advanced to me. Let’s look around the world. Governments seem to behave like children. Petty squabbles, religious bigotry, and grudges that go back decades cloud the minds of these so-called adults. Life in Star Trek’s version of Earth seems pretty nice. I’d like to live there. But of course, in fiction, without these problems, we wouldn’t have a very good story, would we? I’ve always considered myself a traveler, even though I haven’t traveled much. A lot of people have never left their country. A large number of them have rarely left their hometown. I didn’t leave Canada until I was a teenager, when my family went to North Dakota for a family reunion. The next time I left Canada was when I was 28, and that was to move to Japan. I’ve been in Japan for 7 years now, and I have traveled only to Canada via the USA. I have been to Seattle-Tacoma, Detroit and Minneapolis-St. Paul airports, but have not ventured into the cities themselves. I’ve done a lot of reading about countries, though. 1. New Zealand – It’s remote, it’s beautiful, has incredible mountains a lots of wilderness. It has unique wildlife and, from what I’ve heard, a slower pace of life. It seems like a great place to visit. 2. Ireland – I’m fascinated by castles and history. I’d love to see the castles in Ireland, as well as the green countryside. Also, Giant’s Causeway seems very interesting. 3. Australia – The outback has a certain attraction to it. I’ve always wanted to visit a desert, and I think Australia’s is the one I’d like to see the most. Ayer’s Rock/Uluru is a fascinating place, but I’ve often wondered what Alice Springs is like, being so isolated. Tasmania would be interesting, as well. 4. Germany – Again, I like castles, and Germany has plenty. I also like beer and sausage. 5. Costa Rica – Probably the most stable Central American country, it has a big eco-tourism industry that is very attractive. I’d love to see the rainforests of Central America. 6. Norway – My grandmother’s ancestral country has had me very interested. It has plenty to see, including the fjords, historical cities and Vikings. Well, not living Vikings, but the history would be interesting to learn about. 7. Italy – As a lover of history, I can’t forget about Italy. It has some amazing ruins, and it would be great to see Rome, the ruins of Pompeii and Venice. The most active volcano in continental Europe is in Italy, Mt. Etna (I know, it’s not on the mainland, it’s on Sicily). 8. Peru – Lots of history to see here, mainly from the Inca. Machu Picchu is a major attraction, as is Nazca. It would be amazing to see them. 9. Iceland – This is also a remote country, and it seems like a great place to go trekking. The Blue Lagoon is a big hot spring lake that I’d love to see. Reykjavik, from what I’ve seen in pictures, is a nice city, as well. I want to see the glaciers, too. 10. Greece – Finally, a very famous country with a great history and some amazing ruins. There are many islands, and I want to see Santorini, which is the remnant of a gigantic volcanic eruption 3600 years ago. The municipality of Thera looks like it would be great to explore. So, that’s my list. It was hard to only list 10. I’d like to see far more than that, of course. In the future, I would like to write about the places I want to visit in more detail. Where do you want to go? What’s the greatest epic fantasy series? I’m a fan of epic fantasy series. I enjoy seeing familiar characters going through many challenges and adventures over several books. It requires a lot of time devoted to just one story. There are many epic fantasies that I’ve only scratched the surface of. I know that this question has been asked by many and there are websites with personalised lists of the top epic fantasy series, but I’d like to generate a little discussion here. In your opinion, what is the best epic fantasy series? What gets your heart racing whenever the tension rises? What series has made you wait impatiently for the next part, which you eagerly devoured when you finally got your hands on it? Please leave your comments!